Born in Grouville, Jersey, Channel Islands, Harry Vardon became one of the most famous golfers the game has seen and was known to say “Don’t play too much golf. Two rounds a day are plenty.” He started out life as a gardener, but it was his ability on, not with, the green that made Vardon famous, and during his sporting career he won six Open Championships—a feat still unmatched. Remembered as the leading member of golf’s “triumvirate”, he dominated the Open at the turn of the 20th century alongside J. H. Taylor and James Braid. Together, the three men won 16 of the 21 Open Championships between 1984 and 1914 and did much to establish golf as an international sport. Despite the fact that the implements he played with were primitive by modern standards, he was the straightest player who ever lived. In one stretch, for example, he is reported to have played seven consecutive tournament rounds without once hitting the ball off the fairway. When he first visited the US at the turn of the century, his accuracy was so confounding that it nurtured the famous mythological story that Harry never liked to play the same course twice on the same day—on his afternoon round he would have to play out of the divot marks he had made that morning his first time around! 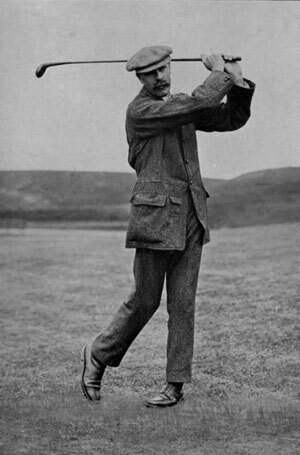 Vardon was known for his accurate drives and his introduction of the overlapping grip on the golf club. Although he did not invent the grip, he certainly popularized it. Known worldwide as the Vardon grip, it is still used by 70% of golfers. Every year the Vardon trophy is awarded to the player on the PGA Tour with the lowest stroke average. James Braid was a Scotsman from Earlsferry (not far from St. Andrews). He was a self-taught golfer, but he taught many others. 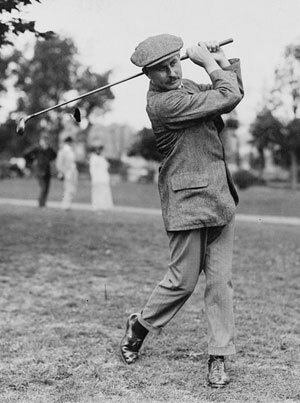 He played down his own skill at the game, even though he was the first to establish a record of five British Open wins. He was a British National Champion, a clubmaker of some skill, a club professional for many years at various clubs, a course designer (nearly 350 of them), and a co-founder of the Professional Golfers Association of Britain. James Braid was a fierce competitor, whether in stroke play, or in match play, in which he excelled. The name “Braid” in Scottish means “an attack” and that was what he did when he played the game. He set records and often won by margins akin to those of Tiger Woods today. It wasn’t uncommon for the golf correspondent covering a match play championship to report, “Braid is in the final! I believe there is someone else in it too!” During his career he had to face the stiffest form of competition in Harry Vardon and J. H. Taylor, fondly known as The Great Triumvirate. These three British players won 16 of the 21 Open Championships between 1984 and 1914. Old Tom was born at St. Andrews in 1821 and competed in every Open championship up to and including 1896. He also won the Open four times and remains the oldest ever winner, having won in 1867 aged 46. Old Tom died at St. Andrews in 1908, and is commemorated, amongst other ways, in the name of the final hole at the Old Course. Tom Morris was born and bred in St. Andrews, on the east coast of Scotland. He began his career as an apprentice feather ball maker with Allan Robertson with whom he worked for 12 years until 1849 when the new gutta ball took away their livelihood. Morris was Keeper of the Greens in Prestwick from 1851 until 1864. 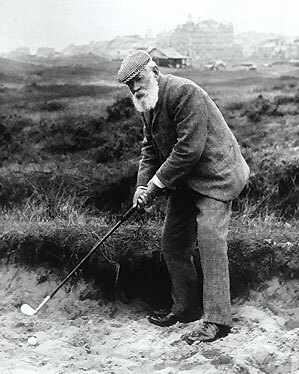 In 1860 Old Tom Morris was instrumental in starting an annual tournament: The British Open. Old Tom won four Open Championships in the 1860s (1861, 1862, 1864, and 1867) and is still the oldest person to have won the event at the age of 46. Old Tom was famed for his course design; his fee: “£1 a day plus expenses”. He played a part in the design of many famous courses, including Prestwick, Royal Dornoch, Muirfield, Carnoustie, Royal County Down, Nairn, and Cruden Bay. More than any man of his time, Old Tom left his imprint on the game. At the Old Course at St. Andrews he helped devise the first metal cups for firming up the hole. He also discovered how sand, scattered over bare spots, encouraged the growth of grass. He crossed the British Isles by donkey cart, train, and steamer, laying out golf courses as obscure as Askernish and as renowned as Muirfield and Royal Dornoch. He even invented the double-loop routing of nine holes to a side that is now standard. As a player, Old Tom was known for good course management and accuracy from tee to green. His weakness was the short putt, suggesting that he patented the yips as well. A letter was once addressed to THE MISSER OF SHORT PUTTS, PRESTWICK, and the document was promptly delivered to Morris. Old Tom’s clubmaking business was established in 1867 by the side of the 18th green of the Old Course. Old Tom Morris died in the year 1908 aged 86. Tom had gained so much respect, that his funeral procession itself spanned the length of South Street in St. Andrews.